-- Please Choose an Option --	X-Small, 6-12" Small, 11-16" Medium, 14-18" Large, 16-24" X-Large, 20-29"
Martingale collars are great for dogs whose heads are smaller then their necks (Greyhounds, Whippets, Italian Greyhounds, Borzoi, Saluki, etc.). Martingale collars are also popular for larger breeds of dogs. The collar slips over your dog’s head, yet it is escape proof. The “loop” enables the whole collar to decrease in size when your dog pulls. This evenly distributes pressure, easing strain on your dog’s neck and coat. The “loop” forms a handle, which is great for restraining your dog at those unexpected moments. AKC dog show owners prefer Martingale dog collars. Little Barks collars are handmade from high-tensile webbing encased in 100% cotton fabric (many to choose from). Sewn with nylon thread for added strength and constructed with heavy metal hardware. 1. Around the circumference of the dog's skull at the widest point in front of the ears. 2. Next, take the actual circumference at smallest point of the throat, just behind the ears and jaw bone. 3. Finally, measure the widest circumference at the center of the neck between the skull and top of the shoulders (withers). Please note that price will change based on collar size. *Custom widths are available. Please contact us for special orders. Custom Embroidery: Make it personal with custom embroidery! Have your pet's name or phone number embroidered on their collar for just $8 more! Select Embroidery option above and enter the name/phone number as you would like it spelled in the option box before placing your order. Please double-check your spelling, as Little Barks assumes no responsibility for typos or misspellings. Please double-check your spelling, as Little Barks assumes no responsibility for typos or misspellings. Please Note that we can only embroidery up to 14 characters on collars and harnesses. As a special note Please keep in mind your thread choices. A high contrast color to your fabric choice works best. Embroidered/Personalized products are not returnable. Thank you. 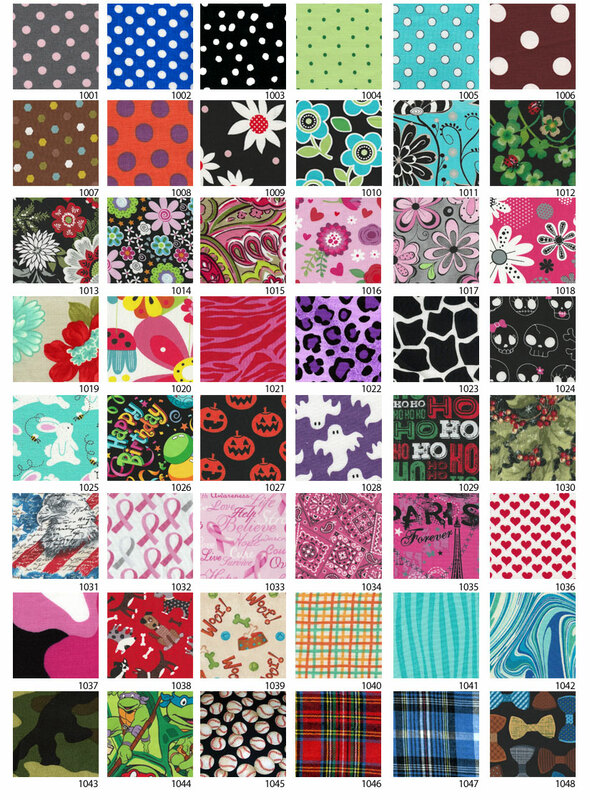 Fabric Choices: in the product options above, please select the number that corresponds with the fabric swatches below.